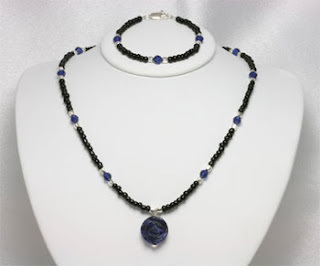 For today only you can save 20% (on the necklace only) The Dark Rose handmade beaded necklace featuring a carved rose sodalite gemstone pendant accented with rich dark blue sapphire Swarovski Crystals, black beads and sterling silver metal. Full design details listed below. Inspiration: Every rose is beautiful, but The Dark Rose is truly exceptional. So exceptional, in fact, it is uniquely one of a kind! The Dark Rose jewelry set includes not only the beaded necklace but the beaded bracelet, as well. Designed with an everyday neutral black color, the sodalite gemstone rose and sapphire crystals lend a look of sophistication to this lovely set. 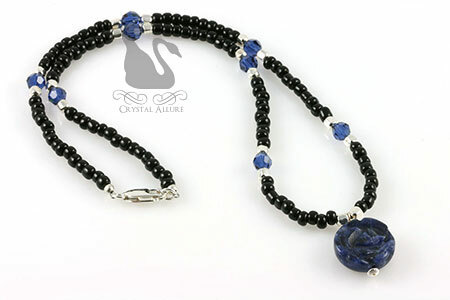 The handmade beaded necklace features a deep rich blue sodalite gemstone carved rose pendant suspended by a mesmerizing strand of blue sapphire Swarovski Crystals, sterling silver spacers and black seed beads. Finished with a sterling silver lobster clasp. The necklace measures 18-1/2″ long with a 3/4″ sodalite carved rose gemstone pendant; the bracelet measures 7-1/4″. Find this handmade beaded jewelry set and many more at Crystal Allure Jewelry. I really like this color combination - very elegant.